Sweden opens its Olympic campaign with a 2-1 victory over Japan, but for the second Games running Japan pushed Tre Kronor all the way. After all the talk and anticipation, the hockey action finally got away in PyeongChang on Saturday, and Sweden's women were the first to celebrate victory edging a hard-earned verdict over a brave Japan. Sara Hjalmarsson's goal early in the third period broke a 1-1 tie and handed the Europeans the victory, but better finishing from the Japanese could easily have delivered a very different story. Swedish goalie Sara Grahn finished with 30 saves to preserve her team's slender advantage even after Japan finished with a 6-on-4 set-up for the last 40 seconds. For Japanese forward Hanae Kubo, the outcome was bitterly disappointing. "I had a good chance to tie the game and I didn't take it, so I'm not satisfied," she said. "For the last four years, we've been trying to improve our physical strength so we can compete with the top teams. I think we have done that, but it did not help us today." 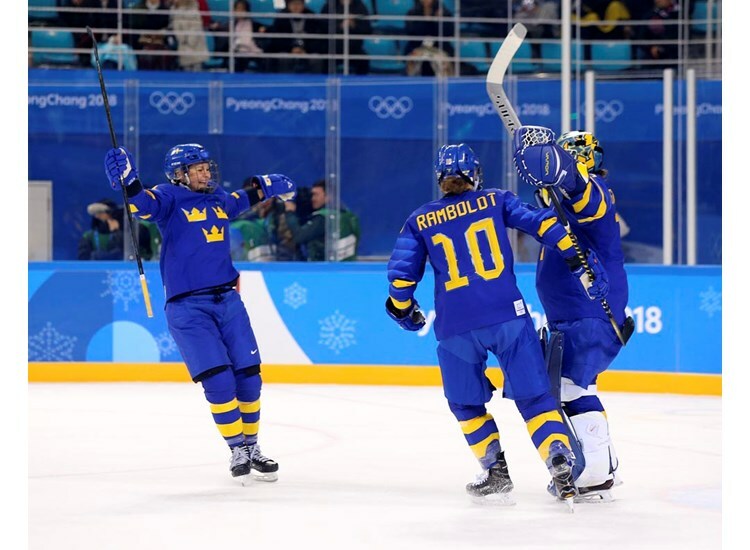 It was a match-up that promised intrigue: four years ago in Sochi the two teams met at the start of the Group B program and Japan, in its first games since hosting the inaugural women’s competition in 1998, pushed the Swedes all the way before going down 0-1. Four years on, the Japanese hoped to claim a first ever victory in Olympic women’s hockey action – and could point to a roster buoyed by several players who had spent time playing overseas in North America or Finland in the intervening years. Against a newly streetwise Japan, Sweden included 17-year-old blue liner Maja Nylen-Persson, a star of the Tre Kronor’s run to World U18 silver in Russia last month. The youngster almost made an immediate impact when her early slap shot narrowly evaded Rebecca Stenberg’s attempt to deflect it beyond Nana Fujimoto in the Japanese net. Japan scrambled that one away, but the reprieve was short-lived. Fanny Rask claimed the honour of the first goal of the 2018 Olympic Winter Games when she collected a Sabina Kuller pass and lifted the puck over Fujimoto’s shoulder and inside the near post to score from a tight angle. Rask, whose brother Victor helped Sweden to men’s World Championship gold in Cologne last year, needed just 2:21 to bag her first ever Olympic goal after failing to register a point in Sochi. "I could see that opening between her head and the crossbar, and it was a fast shot," Rask said. "The goal came on my line's first shift, so it was a pretty good way to start. I've never scored on my first shift in a game as important as this." Delight for Sweden, but for Japan it was time to show some steel behind the Smiles. And gradually the Asian team, enthusiastically backed by a large contingent that had made the short trip across the Sea of Japan, got into the game. Grahn felt the full force of a Haruka Toko shot into her helmet but recovered in time to make a sharp blocker save from Hanae Kubo. Then the Swedish goalie got an extended leg behind Suzuka Taka’s attempt after a defensive error. At the other end, Stenberg could have doubled the lead on a breakaway play but Fujimoto came up with a big save. The middle frame slipped into a something of a lull, with chances at a premium for both teams. But the Japanese fans – the country’s Prime Minister, Shinzo Abe, joined them during the game – had plenty to cheer in the 37th minute when Rui Ukita tied the game. Toko’s hard work behind the net was rewarded when a scramble in front of Grahn’s net ended with Ukita smashing home the puck on the backhand after Kubo’s pass squeezed across the face of goal. Ukita, who has been playing the game since she was just seven years old, described the goal as the finest moment of a career - ahead of her four-point haul at the 2015 Women's World Championship when she led her country's scoring as an 18-year-old. The game was brimming with Eastern promise going into the third, as Japan scented a chance to record its first ever victory at the Olympics. But that dream was shattered within two minutes of the restart as Hjalmarsson restored Sweden’s lead. Erika Grahm forced a turnover in the Japanese zone, and her feed from the behind the net was gobbled up by the AIK Stockholm forward from close range. Japan still created chances: two power-play opportunities went begging, while Ami Nakamura fired a tame shot into Grahn’s midriff when well-placed and Ukita was denied a second by the goalie after lax defence presented her with a position similar to the one from which Hjalmarsson scored the decisive goal. However, the team of smiles lacked the necessary bite to tie the scores a second time and, just as in Sochi, fell to a tight loss against a fancied opponent after one last big save from Grahn to deny Nakamura.